A friend of mine called and asked me if I knew what a Moose Whistle was. Being a Floridian we do not have much call for this item, but I informed my friend it is not used for hunting. In the northern regions more likely you will have a collision with wildlife and even more so it is hard to detect them while driving in blustery snow. A Moose whistle is placed on the front of a vehicle and makes a sound somewhat like a dog whistle that only the moose, deer and other wildlife animals can detect. 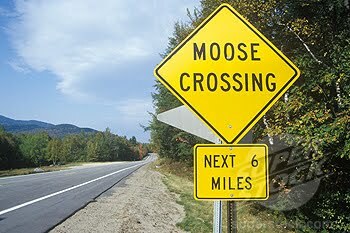 The moose whistle is a tool to help alert the precious wildlife to stay back from your area.and your moving vehicle. One of the most common animals to to come into a collision with a vehicle is a deer. Every year there area multitude of deers getting hit across the country and this type of collision could cost you dearly. How can you be more careful to avoid this? Learn more about the deers habits. Deer have a natural camouflage,and detecting them while driving can be difficult if you are on an interstate and driving at high speeds. It is easier to spot them during the day, but in the early morning hours and evenings this can be a challenge. During the fall and November it is particularly more of a danger for both a driver and a deer when they are looking for food in the winter and mostly in the mountains. Keep an eye out if you are on a road protected by deer fence and keep special attention to where the fences begin and end, as deer can cross in these area’s. Also look for signs like roadside fences are broken down and be sure to slow down in these areas. Hitting a deer can cause severe injury to the animal and damages to your vehicle and injuries to you and your passengers as well. The Moose are also another animal to look out for and can cause more severe injuries and damage all the way around since a moose is much bigger then a deer. The injuries that occur when colliding with a moose are head and neck injuries since the moose is much taller and bigger and the full body weight with the windshield of many vehicles is common. Travel carefully if in the area’s of wildlife and know that the early morning hours from 4 am to 6 am and the evening hours from 6 pm to 11 pm are the most dangerous for the animals and drivers alike.